One of the biggest problems with PC gaming for cooperative games is communication. Traditionally PC games use text based communication as a standard, with voice chat as an afterthought or missing altogether. While there's software available ilke Ventrillo and Teamspeak to assist in this, a dedicated server is still required. Dolby is looking to change this with their brand new technology called Axon. Axon is a software SDK as well as a stand alone service to allow for voice communication between up to 50 people at a time with no dedicated server required. What sets the Dolby service apart from other voice solutions out there are some of the features it has. We fired up the Axon client, which goes into public beta soon, on the PAX 09 show floor and I joined a chat with two other Dolby Reps. We were presented with a small grid and three icons which represented each of us. The icons had an arrow on them facing one direction. What Dolby has done is basically create a virtual chartroom with full positional audio. If someone is virtually sitting to my left in the room, I'll hear more audio from them in my left speaker. You can click and drag the icons around to organize your chat. Dolby will normalize all audio through the service so the chat sounds balanced and is easy to hear. The audio seemed to work fairly well, even on the noisy show floor with headphones on. It did a good job of filtering out the background noise and only letting the voice go through. Finally, like we mentioned earlier, Axon supports up to 50 people in a chat room at once. As you can imagine this could get quite chaotic. The little virtual room can be split into smaller sub rooms at any time, and all you need to do is drag your icon into the sub room on the grid and you magically have a private chat. 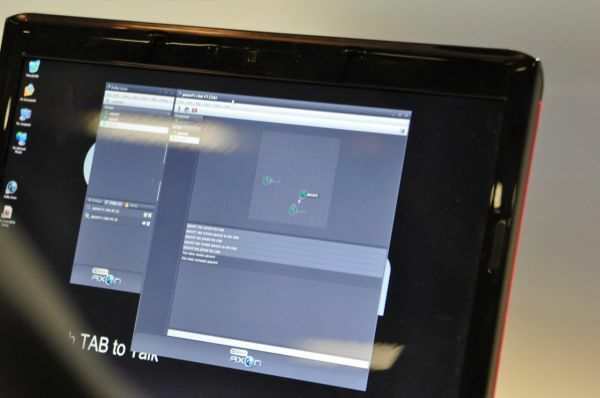 All of this technology was on display in a stand alone client, but certain partners are going to make use of it in their games using the SDK. Jumpgate Evolution is the first game to take advantage of that, and we should be able to get our hands on that sometime this fall when that hits beta as well. Dolby wouldn't spill the beans on pricing - whether we're talking subscription based or one time fee. Page created in 0.5942 seconds.